Our journey begins in Corfu Town, the capital of this beautiful island. We weigh anchor at 9.15am and cruise past the Old Town and Vidos Island, once a penal colony but now a wonderful haven for town dwellers and visitors alike, who walk its forest tracks and explore its small coves and islets. 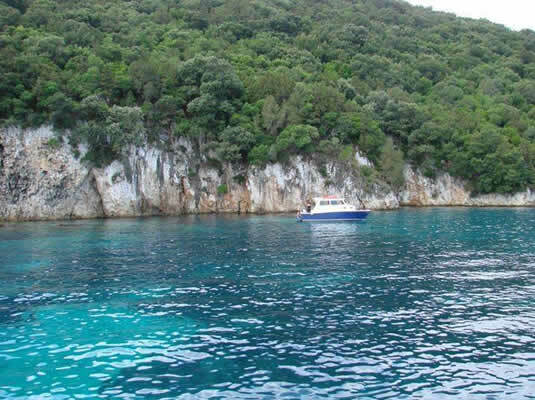 A two hour journey takes us across the Corfu Straits to the Greek mainland where we drop anchor at the lovely little Black Mount island for an hour of swimming in the aquamarine waters of its beautiful Blue Lagoon. We continue to the pretty fishing village of Sivota with its welcoming bars and taverrnas for a one hour and twenty minute stop. You’ll have a chance to do a bit of souvenir hunting or simply sit by the quayside with a relaxing drink. Moving on, we cross a small channel to an impressive cave, used during the 2nd World War as a gunnery post by the Greek navy. This is a wonderful half hour opportunity for photographs as we edge our way inside its cavernous interior. We resume our journey back across the straits of Corfu to the island’s south-east coast, hugging the coastline in a leisurely fashion as we make our way back to our starting point in Corfu Town, docking at approximately 6.00 pm. (While on board, anyone who wishes can enjoy an extremely good value light lunch consisting of chicken fillet, kebabs, spicy local sausage, tzaziki (a yoghurt dip), colourful Greek salad and fresh seasonal fruit or watermelon.